It is my pleasure to serve as your FSU President. Here is an update on some important issues. Raises of up to 3.5% per year over three years (split between a 2.1% cost of living and 1.4% merit). Benefits for all half-time NTTs (there is no longer a waiting period). Promotions for NTTs by FTE, not calendar year accumulations. Continuous employment for NTTs with 3 years FTE service instead of priority lists. Increased research funds and salary anomaly funds. Just cause after 5 instead of 10 years, flexible sabbaticals, continuing appointments, and a PMYR for librarians. For details on this and the entire contract, go to the FSU website. We did not finish bargaining for distance learning, CAPS, the research intensive semester for junior faculty (giving junior faculty a sabbatical or reduced teaching), among other issues. If you are interested in being on the bargaining team to negotiate any of these issues, let us know ASAP. Both Deval Patrick and Charlie Baker sent our new contract to the legislature saying that enough money had been appropriated for our raises in the current budget. The House has passed language validating our contracts. The Senate recently validated them as well, and added $2.2 million and tuition retention to their version of the bill. It will now be fleshed out between both the House and Senate. Governor Baker will have to agree on the additional money to have this appropriated. The university has repeatedly told us that it will honor everything negotiated in our contracts except our raises and additional contributions to our health and welfare fund unless supplemental funding is passed by the legislature. It is unclear if the additional $2.2 million will be enough for the President’s Office to finally agree to pay our raises. Most recently, Ellen O’Connor at UMB acknowledged that something has to be done regarding our raises and that they are hoping to resolve this issue before July 1, even if additional money is not provided by the legislature. April 1, 3:15 pm. ISC ribbon cutting. April 8th, 9:00AM, Board of Trustees Meeting, Worcester. Be a silent presence while the unions tell the Trustees to tell the President and Chancellors to pay us our raises. Postcards: Sign a postcard to the Trustees to tell them to pay our raises. Contact us if you are willing to sign a postcard and/or distribute them to your department to help in this effort. Your Health Care Benefits Costs Have Increased The Group Insurance Commission approved changes that will shift costs for GIC health insurance coverage to subscribers beginning July 1. These changes mean higher out-of-pocket expenses for your health care benefits. Unfortunately, we do not bargain our health care benefits; these are established by this Commission, and it is too late to change these. These higher costs to you have resulted from budget shortfalls largely due to chronic underfunding by the state, as well as increased claim costs. For details see http://www.mass.gov/anf/docs/gic/pdfs/2015ratesheet.pdf. Details regarding the percentage change in your specific plan, are available here. In his budget, the Governor proposed to increase the share of the premium you pay. The premium splits which apply to current retirees differ depending on the date of retirement in a range from 90/10 to 80/20. Governor Baker proposes that employees who retire after July 1, 2015 contribute 25%, for a split of 75/25. Stop your share of health care premiums from increasing! Attend the MTA lobbying day on Thursday, April 2nd, 9:30 AM at the State House in the Gardner Audi-torium to tell legislatures that we oppose these proposed increases, and that with the increases in co-pays and deductibles, these increased premium costs will be a hardship for our families. Testify or send testimony on any aspect of the budget, including how state cuts have affected you, including this higher share of premiums for employees, on Monday, April 13 at 11 am at the State House. Testimony is limited to three minutes. If you have any questions contact the FSU office. Unfortunately, the Governor’s early retirement incentives do NOT include higher education employees. Thanks to Zsusa Kaldy and Lusa Lo for serving on the FSU salary anomaly committee. Salary anomalies for 2013-2014 should be completed this year. You will be receiving a letter notifying you if you were considered, and if so, if you will receive any back pay. The FSU is conducting an evaluation of the 2:2 in the College of Liberal Arts. Contact us if you have comments on how this has worked, suggestions for improvements or changes, or if you want to help us with this evaluation. You should have received a letter from the Provost informing you how much you have to spend. You must submit reimbursement requests and receipts to your Dean’s Office by June 1, 2015 to receive this money. This is a new software program the university will use to compare departments and programs at UMB to other departments and programs nation-wide regarding cost, student success, student completion rates, and program success. The Provost has assured the FSU that it will not be used to evaluate faculty, but since these may be used to eliminate or change programs and degrees, faculty should be involved in how it is implemented to assess departments and programs. Elections will be held this spring, in April. Slots for Non-Tenure Track Faculty, Tenure Track Faculty, Tenured Faculty, as well as the office of Vice President are open. 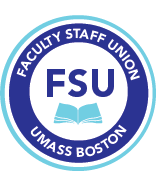 This is a great way to be involved in your union, and it requires meeting once a month during the academic year to make decisions that affect your colleagues. This work counts as university service in your workload. Contact us if you are interested in running. Interested in Helping Us with Communications? The FSU is looking for an assistant editor to help with the newsletter. Position comes with a small stipend. Also wanted: members to assist us with social media, writing articles for the newsletter, and to work on all other elements of FSU communication. Let us know if you are interested. The FSU is now on Twitter! Follow us @FSU_UMB. Got a problem, question, or want to help on any of these issues? Contact us at fsu@umb.edu.